As you will probably know if you've read this blog more than twice, I am a keen and reasonably successful op shopper/eBayer/trader/receiver of second-hand goods. 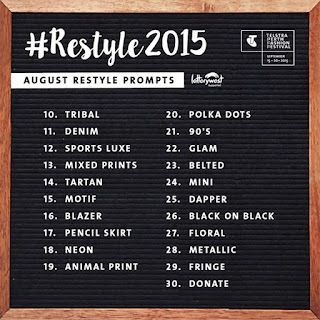 When I saw the Restyle 2015 challenge pop up on Instagram and at In The Dress Up Box, I knew I'd have to get amongst it, given that it's unusual for me not to be wearing a second-hand item on any given day. With Stacie and Jen also on board, we were ready to play! 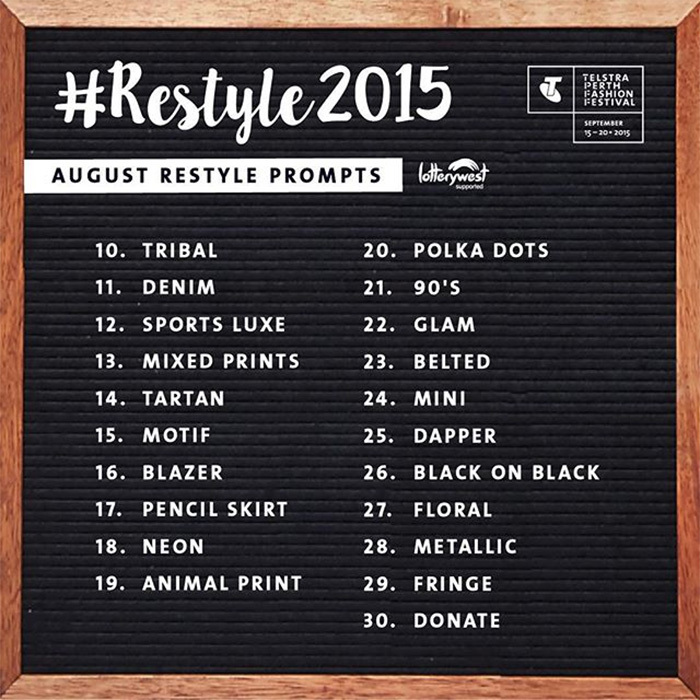 Restyle is part of the Telstra Perth Fashion Festival and has local bloggers, fashion identities, designers etc. showing how to work op shopped items into everyday looks, partnering with a host of op shop charities and encouraging people to play along on social media for their chance to walk the Restyle Runway. I would love to see something like this happen in Adelaide and would totally volunteer to assist if anyone is keen to get it going. This was a difficult one for me straight off the bat. I had an Aztecy-style print sleeveless top but it was bought retail. Would I have to bail on the very first prompt?? Then I found this vaguely tribal necklace in my collection that I'd bought from Savers and still hadn't worn so I was planning to build an outfit around it. Unfortunately, I wasn't feeling up to going to work so I created this little display instead with one of my vintage elephant book-ends. Once I remembered that cropped jeans still existed in my wardrobe (having worn only full length by necessity during this ridic cold winter weather), I pulled out this Crossroads pair I got at the Regen Op Shop a while ago. Happily (?) they are now a bit big for me and have gone all slidey so it's probably about time they went on to someone else. So comfy though. Day 3 - "Sports Luxe"
I had NO sports luxe, nothing, nada, op shopped or otherwise as it's not a trend I really feel. I wore this check Inspyre shirt, a new pair of Kmart luxe joggers and heels plus ponytail so totally answering the prompt and adding the restyle element by borrowing a blazer from Stacie. Pretty actual happy with this look. I think I'll do it again in the warmer weather! Day 4 - "Mixed Prints"
Mixing prints is still not something I do regularly or with much confidence, unless it's stripes and leopard which is a combo that totally belongs together. This skirt, however, does all the work for me! A patchwork print in a long skirt in orange and brown is not something I would have gone for normally, however Stacie passed it on after acquiring it at the Buffalo Exchange in her home town of Dallas, Texas and when I tried it on and it worked, it was happiness all round. I'm hanging for warmer weather to wear this with a simple tee and some tan wedges, which is probably as close as I'll get to the 70s trend. Also, it has POCKETS! Joy! I love tartan so I was more surprised than anyone to note that I actually don't have any besides a Kmart scarf. I even dug an old (and very short!) tartan skirt out of the dress-up box but it's no longer a happening thing (and I used to wear it to work!! Bare-legged! OMG!) I lay awake at night mentally combing my wardrobe when I remembered these sunglasses I stole from my sister who got them at Savers. When I pulled them out for the photo, the remembered tartan was more like a vaguely coloured checkerboard pattern but needs must. Note to self: acquire some tartan. After a vigorous discussion with Stacie and Jen over what constituted a motif and a reflection on how fashion tastes change (I was all about the logo tee in the 90s; Sportsgirl, Country Road, Australis, Cherry Lane, Gucci knock-offs, remember those?) I chose these Vivienne Westwood for Melissa jellies procured from Savers for $6.99 (START THE CAR!) with their distinctive orb motif. Easy. I am a recent convert to the blazer, having acquired two in the one trip to the Salvos in Gepps Cross so this one was quite easy. I'm wearing my $12 Cue blazer with a leopard scarf from Savers, Kmart sunglasses and a knit jumper from Rivers. The dappled light effect is nice but it does make me look like I have chocolate on my mouth. I don't. I swear. Style challenges are a fun way to get creative with your wardrobe and working in an op-shopped element adds to the challenge. Join me next week for a wrap-up of Week 2 or follow me on Instagram for up-to-the-minute news and events! Also, if it's not too much trouble, please can you vote for me in the Heritage Bank Blog Awards? Much obliged.